Home » Style & Beauty » Hair & Beauty » Luxury spa treatments in Singapore – tried and tested! 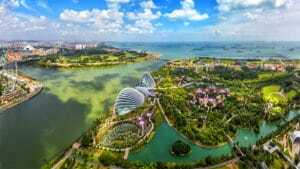 Luxury spa treatments in Singapore – tried and tested! Known for their luxurious skincare that harnesses the healing benefits of sea kelp, I opted for the La Mer Signature Renewal Facial in hopes that it would revive my dull, tired skin. Once I had changed into a plush dressing gown, my therapist asked me a few questions in order customise the facial. Based on my answers, she picked products that would hydrate and nourish my dry, ageing skin and got to work. My skin was double cleansed to remove all traces of makeup. Next came a scrub. This removes the dead skin so ingredients from the skincare that follows are better absorbed. To further enhance this absorption, and to help soften the skin and dilate my pores, she placed a warm compress on my face. I prefer this to the usual blast of steam you get at most facials as I find it less dehydrating. With my skin suitably prepped, she went on to apply the treatment lotion and massage it into my skin with the signature facial massage technique. This technique helps improve blood circulation and encourages lymphatic drainage to tackle any water retention or puffiness. With expert strokes she manipulated my facial muscles to lift and firm them. She then gently massaged my eyes with a roller ball device as well as her fingers to tackle dark circles and fine lines. Next, it was time for intense hydration with a mask that was smoothed all over my face and neck. The rich, luxurious mask is infused with the skincare brand’s signature ‘Miracle Broth’ which is rich in fermented sea kelp. Suitable for all skin types, it promises to heal, hydrate and brighten the skin. After 20 minutes, (during which you’re treated to a blissful hand massage) the mask is first massaged and then wiped off with a warm towel to reveal fresh, plump skin. My treatment concluded with an entire skincare routine that included toner, treatment lotion, renewal oil, eye cream and gel cream moisturiser. Post facial my skin looked plumper, brighter and definitely felt more hydrated. Given the option to choose from three Sulwhasoo facials, I opted for the Concentrated Ginseng Rejuvenating Facial, which seemed best suited to my skin type: oily with the first signs of ageing. Using ginseng and jade, the facial helps remove impurities while addressing my first few fine lines – exactly what I needed now that I am closer to 30. All Sulwhasoo facials start by selecting your preferred scent from four options – sandalwood, pine, prunus mume (Japanese apricot), and aloes wood, which is then used throughout the treatment. I found pine to be the most soothing. My therapist then used this scent on a dry cotton sheet and proceeded to massage my face and head. Not only is this pine-scented dry sheet massage intensely relaxing, it also serves to stimulate the skin, encourage lymphatic circulation, strengthen the skin’s natural barrier and remove impurities. This is followed by a double cleanse to remove makeup and a gentle scrub to exfoliate dead skin. My skin suitably prepped, my therapist began to massage in the Concentrated Ginseng Renewing Cream using a pair of cold jade rings. I’m told that the cool surface actually helps improve blood circulation and further eliminate impurities from the skin. Based on the yin and yang philosophy, the jade and ginseng work together to boost the results of this facial. She continued massaging my neck and shoulders, this time using the Capsulized Ginseng Fortifying Serum with a “lifting” massage technique – gentle pinching steps that firm and lift the skin. Mind and body relaxed, it’s the first facial I’ve fallen asleep at. As I snoozed, the therapist applied a generous layer of the Remodeling Mask all over my face. I was left to relax while the mask hydrated and nourished my skin. The Concentrated Ginseng Renewing Eye Cream and Essential Lip Serum were applied after the mask was cleansed off and I was on my way. My skin looked so good the next day, I even skipped my usual makeup routine. UrbanHair Salon is famed for its sleek cuts and intensive hair treatments. With Singapore’s weather playing havoc with my fine blonde hair, I booked a Hair and Scalp Therapy Treatment to nourish my hair for the long term. The focus of this treatment was to check the health of my scalp and address problem areas. Using a hand-held camera and video screen that magnified my scalp and the roots of my hair, my consultant indicated areas of redness and dead skin cells that needed attention. He explained the growth and health of my hair was being inhibited by the condition of my dry scalp. Using this information, he then customised my treatment using Aveda products. These plant-based products are gentle, yet effective. With the analysis complete, I was whisked to a tranquil private room. To enhance the Hair and Scalp therapy treatments, Aveda has designed seven aromas to balance your chakras or the seven energy centres within the body. I selected Chakra 3 (‘Intention’), a refreshing mix of organic lavender, fir balsam and lemon essential oils, which was then spritzed around the room. The treatment started with a head, neck and shoulder massage and I felt the stress melt away. My consultant then applied the Invati Scalp Revitalizer directly to my scalp in sections and washed it off with the Aveda ‘Shampure’ Shampoo, to give my roots a deep cleanse. With impurities out of the way, the Invati Penetrative Treatment and the Aveda Dry Remedy Moisturising Masque were applied, and I was left to relax under the steamer as the cuticles (the outer part of the hair shaft) expand to absorb the nutrients from the treatment. Fifteen minutes later, my hair is rinsed with cold water to ‘close’ the cuticles and lock in the treatment. The treatment is completed with a blow dry. Back at the main salon, my consultant uses a magnifying camera to show me the post treatment results. I’m impressed: the flakiness had all but disappeared, and the redness was greatly reduced. My hair felt lighter and smoother, and the scent of my chosen Chakra aroma still floated in the air. Discover more style and beauty tips.